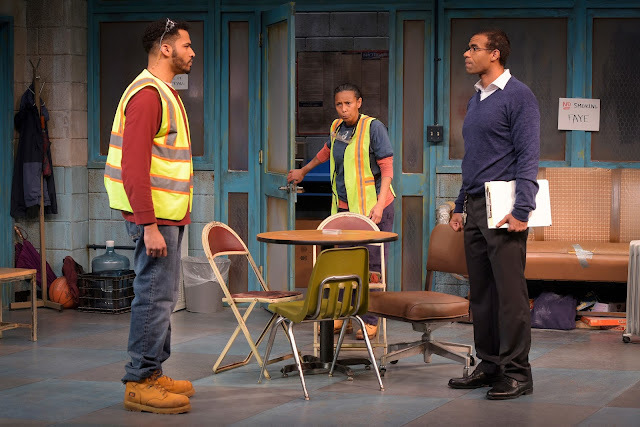 As playwright Dominique Morisseau tells it in “Skeleton Crew,” uncertainty hangs over the lives of four black employees of Detroit’s last auto stamping plant in 2008. Marin Theatre Company is presenting the Bay Area premiere of this Obie-winning drama as a co-production with TheatreWorks Silicon Valley. All of the action takes place in the plant’s break room where the pregnant and unmarried Shanita (Tristan Cunningham), supervisor Reggie (Lance Gardner), union representative Faye (Margo Hall) and edgy Dez (Christian Thompson) have various conversations and confrontations. Each has a concern. Shanita wants to be able to care for her child. Reggie wants to support his wife and children and pay his mortgage. He’s also torn between supporting the workers and appeasing management. Faye, a 29-year worker, wants to reach the 30-year mark so that she can collect her full pension and keep her health benefits. Dez wants to open his own business. Faye is often the voice of reason, but she’s forced to keep secrets. She and Reggie have ties that go way back and that are gradually revealed. Shanita plays by the rules and tries to fend off Dez’s flirting, but the chemistry develops. Dez appears to be dangerous and possibly devious. The characters are sometimes difficult to understand. This is mainly true of Thompson as Dez, especially in his fast-talking initial scenes. Director Jade King Carroll orchestrates the conversations and confrontations well. She’s aided in the effort by fine performances by Hall as Faye, Cunningham as Shanita and Gardner as Reggie. Thompson has a tougher task as Dez because the character isn’t always likable. Since this is a co-production, Ed Haynes’ set was built in TheatreWorks’ scene shop on the Peninsula and trucked to Mill Valley, said TheatreWorks artistic director Robert Kelley, who was at opening night with others from his company. The lighting is by Steve Mannshardt, costumes by Callie Floor, sound by Karin Graybash and projections by Mike Post. Running about two hours with one intermission, “Skeleton Crew” will continue through Feb. 18 at Marin Theatre Company, 397 Miller Ave., Mill Valley. For tickets and information, call (415) 388-5208 or visit www.marintheatre.org. The entire production, including set, costumes and cast, will move to the Lucie Stern Theatre, 1305 Middlefield Road, Palo Alto, for TheatreWorks’ presentation running March 7-April 1. For tickets and information, call (650) 463-1960 or visit www.theatreworks.org.